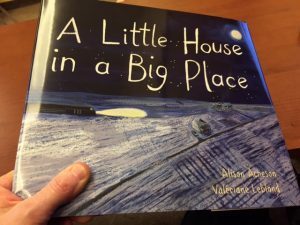 On Wednesday, Feb. 20, I had the pleasure to share A Little House in a Big Place with some of the learners at Anderson Mill Elementary… making this the first school to be introduced to the new book! It was “reading week” at UBC, where I teach, so I flew with my friend to visit Austin, Texas, where one of my longest-ever friends lives. While there, I met one of my friend’s longest-ever friends, and then I met his spouse, Mrs. Husty. 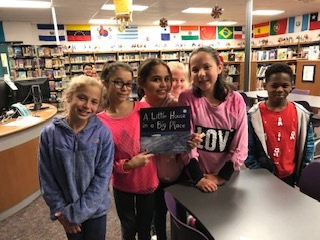 She teaches at Anderson Mill Elementary, and I gave her a copy of A Little House…and then we talked and decided I would go visit the children in her class. And she would ask Mrs. Brumley’s class to join us! 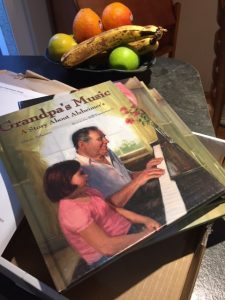 When I arrived, I discovered that altogether the children and Mrs. Husty and Mrs. Brumley had done the wonderful thing of already having read the book and…my favourite: come up with GQ…that is, Good Questions. I love Good Questions! And I got to meet the school librarian, Ms. Henson… another one of my favourite things to do: meet the Librarian! I do love Austin. It is a place full of amazing music EVERYWHERE. And many good places to walk, which is something that is important to me. There’s a beautiful river that runs through the city. But this class visit was a highlight! Sharing stories has a way of bringing people together. Thank you, Anderson Mill Elementary! Thank you for the invite, Mrs. Husty! Ah…another moment in a writer’s life: getting an email to advise me that my book, published in 2009, is now going OOP. That is, out-of-print. There were only four copies remaining, sitting lonely in some warehouse somewhere. Somewhere house. Just like in December, when my new book showed up, these came along. And in a most odd way there is something equally ceremonious to seeing a work through to its close. And I feel a rush of affection for libraries. Libraries take care of books and give them a home while people still share them. Still life with books. Life stills with books. On December 12, my neighbour knocked on my door. Where I live, in east Vancouver, if there are packages left outside the door, a neighbour will grab it and take it into their house for safekeeping until you are home. So she had in her hands a large padded envelope. I wasn’t thinking about my book when I opened it; my dad had passed away two days before, and the book wasn’t supposed to be out until the spring. I opened the envelope, and there was A Little House in a Big Place! Technology is a pretty amazing thing! 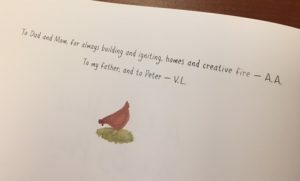 Months before the people at the publishing house, Kids Can, had sent me pdfs of all the pages, and I was able to show the dedication in the book to my dad on my laptop. He was so happy to see it all. He couldn’t talk then; he hadn’t talked for a long time. He had a disease called ALS, and ALS affects how the brain connects with muscles and communicates–his muscles just weren’t working. But he could see and he could type on an ipad to let me know his thoughts. And he was excited about the book. My dad was a carpenter. He built beautiful homes for people. The house I grew up in, he’d built. And he was always finding something to fix or build in the home in which my boys grew up. 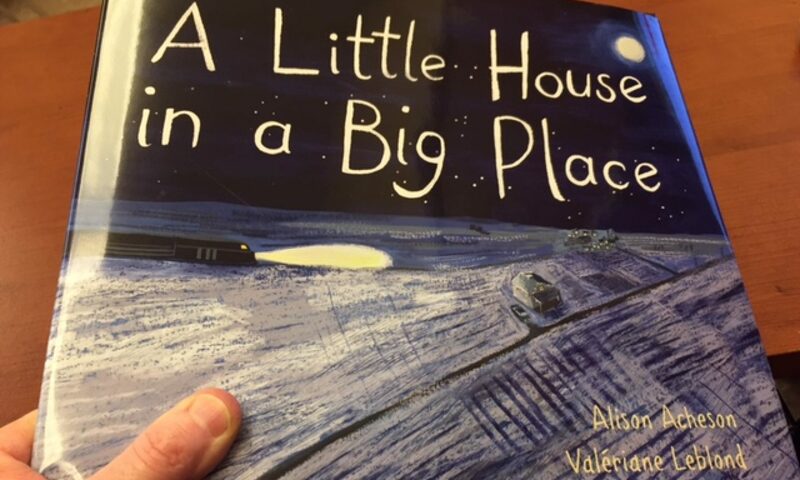 As I held A Little House in my hands that first time, I thought about how this is now the tenth time I’ve done this: held the product of my work in my hands. But for my dad, at the end of every work day, he SAW his work. Maybe he’d built a wall that day, or maybe he’d painted, or put in doors or windows. I often witnessed how he worked and I knew that at the end of every day he took time to thoroughly clean his workplace, sweeping sawdust, sorting leftovers of wood, organizing gyp-roc, then cleaning and caring for his tools, and securing the site. What is it, I wondered, to actually SEE one’s work every day, to see changes, to see it growing. Writing isn’t quite like that. I might have a feeling about what I’ve done–whether it’s “enough”–whatever that might be. Or if I feel that whatever I’ve produced is “good.” See how I’ve put quotation marks around that? That’s because I’m not really certain. Sometimes I write something that seems to be what I want it to be, and the next day or the next week, I look at it and realize it’s not what I thought it is and it needs to be tossed and done over. My dad couldn’t afford to do that with a wall; he had to get it right the first time. And then it was done.